Few services can transform a room the way uplighting can. Uplighting consists of multiple led uplights strategically placed on the walls creating a color wash around the entire room. By using the latest technology in the industry, we are able to offer you battery powered cable free uplights for a super clean setup. 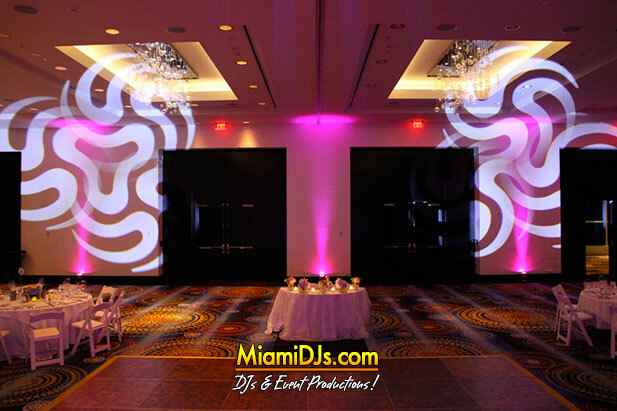 Miami DJs also features wireless dynamic uplights, which can be programmed to change colors with the beat of the music. 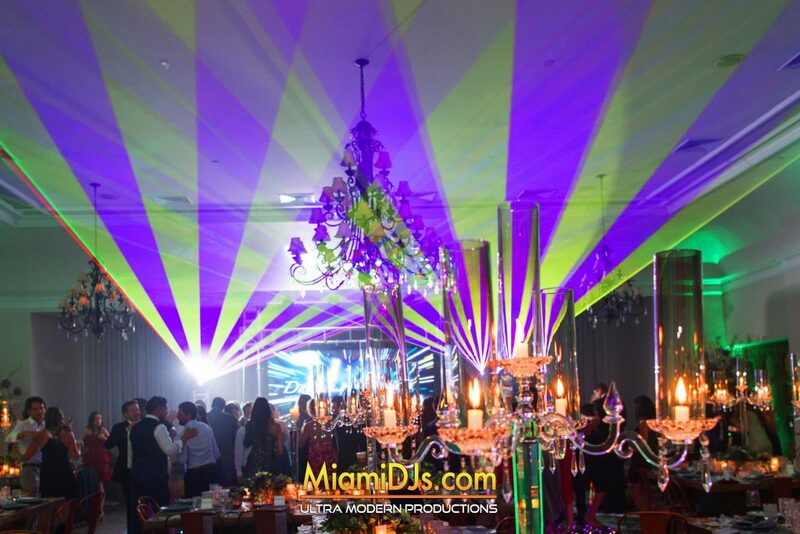 For more information on uplighting, please call us at 786.333.6757 for a complimentary consultation. Miami DJs uses the latest technology in lighting to create incredible light shows. We feature top of the line high powered led moving heads & multi colored lasers to create a club like atmosphere at your next event. All of our lighting can be programmed and controlled for music synchronization and on demand blackouts. Our LED Moving Heads are a great way of adding visual effects to any room. Best of all they can be programmed to offer two different type of light shows. A subtle lighting enhancement for decor during dinner and a complete light show once the dancing portion of the evening begins. These moving heads can be placed on the floor or on Trusses (7 ft Light Towers) as included in our Ultimate & Ultra Modern Package. Although, the effect will be the same, when moving heads are placed high on top of our light towers, the view is completely unobstructed from any guests who might be dancing right in front of them. Another benefit of placing the Moving Heads on light towers, is that they can be used for spot lighting. Our Laser Light Show consists of High Powered Multi Colored Lasers that will create an incredible laser light show giving an instant club feel to any event. Whether you’re looking to spice up your wedding, or simply bring that south beach club feel to your event, our Laser Light Show is perfect for you. Our Dual Head Lasers are placed on top of the speakers, and come with a Hazer (light, odorless fog) which allows you to see the trajectory of the lasers. Our Laser Light Show works best when used indoors and on venues where fog machines or hazers are allowed.